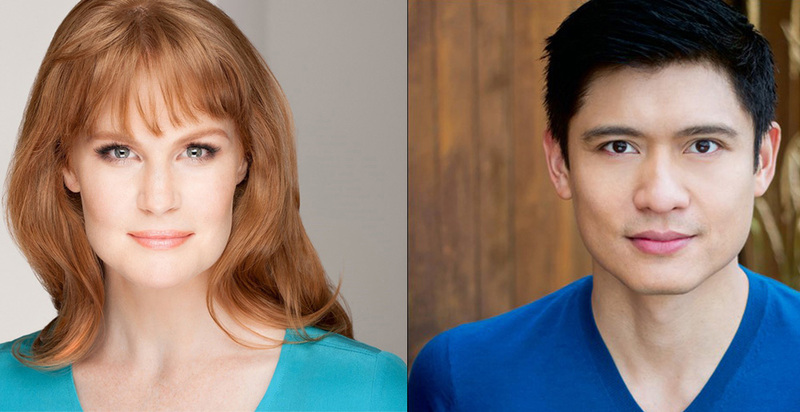 CHICAGO – Lyric Opera of Chicago announced today that Tony Award-nominated Kate Baldwin and Paolo Montalban will star as Anna Leonowens and the King of Siam in Lyric’s grand-scale production of Rodgers and Hammerstein’s The King and I, April 29-May 22, 2016. A graduate of Northwestern University, Baldwin last appeared onstage in Chicago in the Broadway-bound musical Big Fish. Montalban has been seen in Broadway productions of Pacific Overtures and The King and I, and is best known for starring as the Prince in ABC’s telefilm of Rodgers and Hammerstein’s Cinderella, alongside Brandy and Whitney Houston. The King and I is the fourth Rodgers and Hammerstein musical to be presented as part of Lyric’s American Musical Initiative. Lee Blakeley, who staged the production’s 2014 premiere at Theatre du Chatelet in Paris, helms the Lyric presentation with an all new cast, teaming up with veteran Broadway conductor David Chase, who conducted Lyric’s acclaimed Carousel last season. The creative team also includes choreographer Peggy Hickey, scenic designer Jean-Marc Puissant and costume designer Sue Blane. Lyric Opera’s The King and I runs April 29 through May 22 (press opening April 30) at the Civic Opera House, 20 N. Wacker Drive, Chicago. Tickets start at $29 and are available now at lyricopera.org/king or at 312-827-5600. Kate Baldwin earned Tony, Drama Desk and Outer Critic’s Circle Award nominations for her starring role in the 2009 revival of Finian’s Rainbow. She went on to star in Big Fish on Broadway playing Sandra Bloom, in Fiorello! at City Center Encores and Giant as Leslie Lyntonn Benedict at The Public Theater, for which she received a Drama Desk nomination. Baldwin also starred in Can-Can at The Paper Mill Playhouse and Off-Broadway in the Keen Company production of John and Jen, for which she received a 2015 Drama Desk nomination. She recently finished a critically acclaimed run in the new musical Songbird at 59E59 Street Theater Off-Broadway with a book and music by Lauren Pritchard and Michael Kimmel. Kate has appeared in the Broadway casts of The Full Monty, Thoroughly Modern Millie and Wonderful Town. She starred in Irving Berlin’s White Christmas (San Francisco, Detroit, Toronto), The Women at The Old Globe, Henry V at the Shakespeare Theatre of New Jersey, I Do, I Do at Westport Country Playhouse, She Loves Me at the Willliamstown Theatre Festival, and South Pacific at Arena Stage, earning a Helen Hayes Award nomination. Kate has performed in concert with the Boston Pops, New York Pops, with the American Songbook series at Lincoln Center, the Kennedy Center and at the legendary New York nightclubs Feinstein’s at the Regency, Birdland and 54 Below. Her concert work also includes several appearances with Stephen Sondheim in his critically acclaimed evening, “A Conversation with Stephen Sondheim.” She has sung as part of the Chicago Humanities Festival, with the National Symphony Orchestra in Washington, DC, the Detroit Symphony Orchestra, the Portland Symphony Orchestra, The Phoenix Symphony and the River Concert Series. Television, her work includes NBC’s “Law & Order: SVU” and the PBS filming of Stephen Sondheim’s Passion. Kate’s debut album on PS Classics, “Let’s See What Happens” features Lane and Harburg songs from both stage and film. Paolo Montalban is best known for his portrayal of the Prince in ABC’s Wonderful World of Disney telefilm of Rodgers and Hammerstein’s Cinderella. On Broadway he has been seen as Manjiro in Pacific Overtures, performed the role of Lun Tha in The King & I, and in the play Breakfast at Tiffany’s. Off-Broadway he appeared in Shakespeare in the Park’s Two Gentlemen of Verona as Eglamour and in Ma-Yi Theater’s production of The Romance of Magno Rubio as Claro. Recent regional credits include Count Carl Magnus in A Little Night Music at American Conservatory Theater, Arthur in the reconceived production of The Unsinkable Molly Brown at Denver Center Theatre, and The Emperor in a co-production of The Orphan of Zhao shared between ACT and La Jolla Playhouse. On television, he played the series lead Kung Lao on TNT’s “Mortal Kombat: Conquest”, as well as roles on “Madam Secretary,” “The Blacklist,” “Nurse Jackie,” “One Life to Live,” and “Law & Order: SVU.” He has also acted in the films Just Wright, The Great Raid, and festival favorite Two Weeks. Paolo has sung as a guest soloist with The San Francisco Symphony and has performed at Carnegie Hall and Alice Tully Hall. Lyric Opera’s company premiere of The King and I is generously made possible by The Negaunee Foundation, two Anonymous Donors, Robert S. and Susan E. Morrison, and Northern Trust. Founded in 1954, Lyric Opera of Chicago’s mission is to express and promote the life-changing, transformational, revelatory power of great opera. Lyric exists to provide a broad, deep and relevant cultural service to Chicago and the nation, and to advance the development of the art form. Lyric is dedicated to producing and performing consistently thrilling, entertaining and thought-provoking opera with a balanced repertoire of core classics, lesser-known masterpieces and new works; to creating an innovative and wide-ranging program of community engagement and educational activities; and to developing exceptional emerging operatic talent. Under the leadership of general director Anthony Freud, music director Sir Andrew Davis and creative consultant Renee Fleming, Lyric strives to become The Great North American Opera Company for the 21st century: a globally significant arts organization embodying the core values of excellence, relevance and fiscal responsibility. Visit www.lyricopera.orgfor more information.